After driving MGB GT’s for many year, a family with child and dog asked for more space. So up to England in the 'B and looking for a Magnette (it must be a MG!). After looking some overpriced Z-Magnettes a friend told of a friend who has a Farina Magnette. Passing half England, here it is the white and green '62 Magnette MKIV. No original colour, but not to much rust and a good runner. 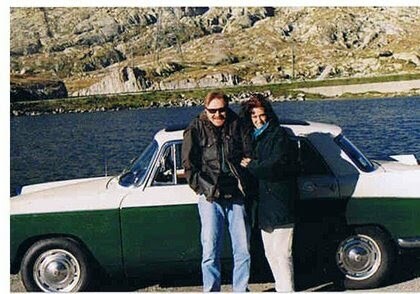 Calling in my father by a cheap flight and driving back to Switzerland in MG-convoy. After some preparations for the strict swiss MOT (it had a english MOT, but neede still some hours work with metal, suspension, lights and dripping oil) it passed first time. Now I have it for almost 10 years, spend many good drives and the family likes it too. No problems to drive with a RHD car here over in LHD-Switzerland, the people like this old shape cars and often give a smile. And it isn’t the slowest car with the double carbs, good tyres and fresh suspension items. But as i need for my hobbies even more space I'm looking for an Estate (Traveller or Countryman) to join the Magnette!